The M.P.P.U.P. 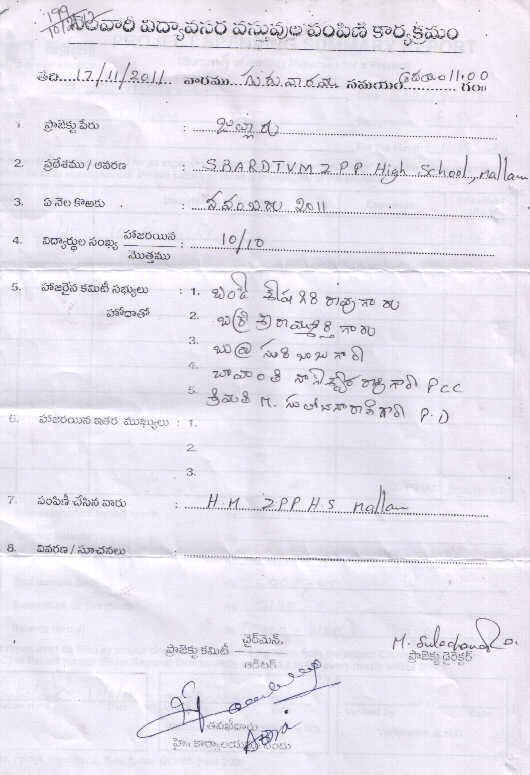 School Jalluru and S.B.A.R.D.T.V.M.Z.P.P.H. 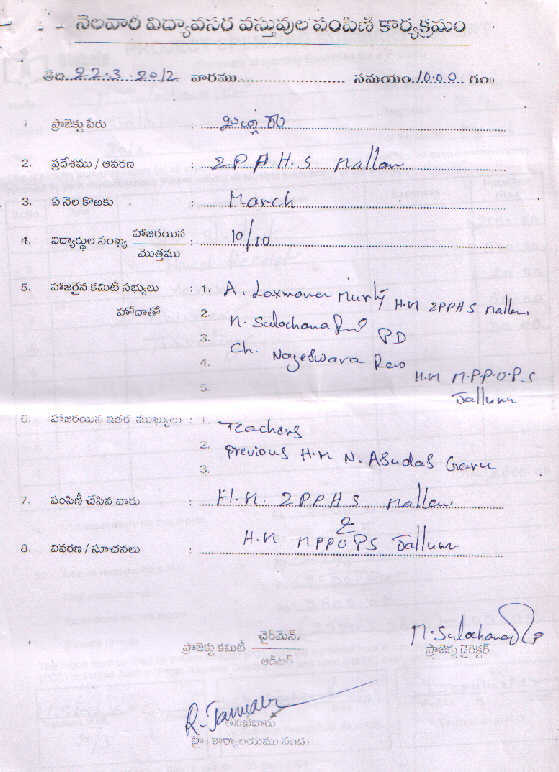 School Mallam have been selected for to commence Bighelp project by Executive Body. Jalluru and Mallam are small villages in Pithapuram Mandal in East Godavari district, Andhra Pradesh, India; this project serves the children in around the villages of Subbarayudupeta, Govindarajupalem, Kodandaramapuram and Gorinta under Sponsor-A-Child program. Teja is an orphan and remaining students selected are semi-orphans and financially very poor. All of these children are at the brink of discontinuing their studies due to their deprived condition before Bighelp sponsor their education. The full details of each sponsoring child are provided below. Additional children will be sponsored in this project as we continue to find the eligible children. This is our second project in the district of East Godavari and is the 25th active project for Bighelp in the state of Andhra Pradesh under Sponsor-A-Child program. This project helps the orphans and underprivileged children to continue their studies with the support of their sponsoring donors. In addition to getting financial assistance to pay the school fees, buy books, cloths, shoes, educational material and private tuition, in this program children are benefited from more individual attention by our project directors and project committee (group of Bighelp volunteers) that has been established in this village. These students will continue to get the sponsorship from Bighelp until they complete their 12th grade as long as they continue to perform well and meet the eligibility criteria. . There are many children in and around the villages of Jalluru and Mallam who have no option but abandon their schooling and go to work to support their family. The situation is even worse if the child does not have parents and earn their bread themselves. For all children sponsored under this project, it was almost everyday struggle for their existence and continuing their education was distant dream. Bighelp was able to form a project committee with the support of school headmaster, teachers, and villagers to help these underprivileged children and hope to give them a gift of bright future with the help of the sponsoring donors. Each of these children has a dream to have a better life and be the better citizen through education. Sandhya wants to become a Teacher, Satish wants to become a scientist and Jyothi wants to become a Doctor. Every child has a goal, but does not have any support to reach their goals. Bighelp is committed to provide all the necessary support and hopes to bring their dreams come true with the help of their sponsors. Jalluru is a village in Pithapuram Mandal of East Godavari District, Andhra Pradesh, India. It is around 15 Kilometers away from Kakinada district head quarters. Kakinada is a town about 570 KMS away from Hyderabad and is connected by Road and Rail. The people of the village are dependents on Agriculture Labor and Fishing. Since the village situated near to the sea will experience natural calamities very frequently. Due to this the people in the villages suffer for their existence. In these circumstances the education for their children is heavy burden for them. Hence Bighelp intended to help the poor children in the village through Sponsor A Child program. Smt. M.Sarojini Managing Trustee Bighelp made her sincere efforts to bring them out from the darkness. She explained the situation to Chairman and Smt. Sudha Srinivas. 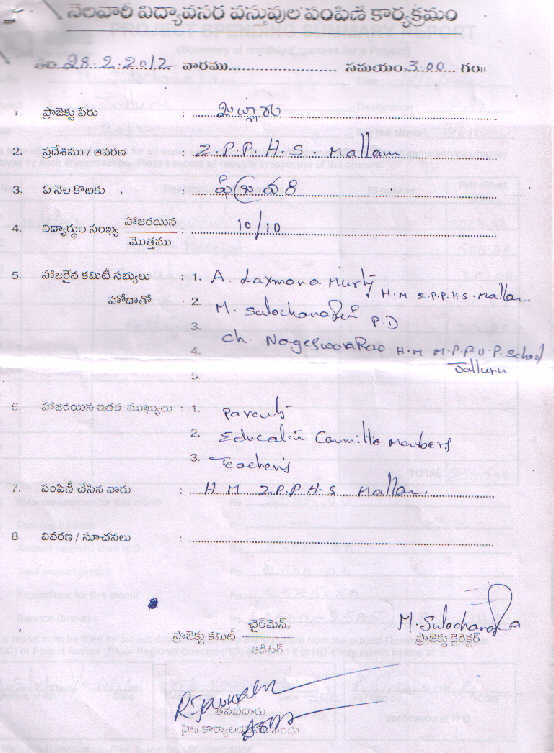 Bighelp Chairman Sri. Chand Pasha Shaik very much felt and came to a conclusion the Bighelp should help the poor and needy children. Smt. Sudha Srinivas came forward to help these underprivileged children. Bighelp project will continue in this village as long as our local project committee (group of volunteers) in this village continues to work hard and improve the educational opportunities for the needy children. The M.P.P.U.P. School situated in Jalluru and Z.P.P. H. School in Mallam. 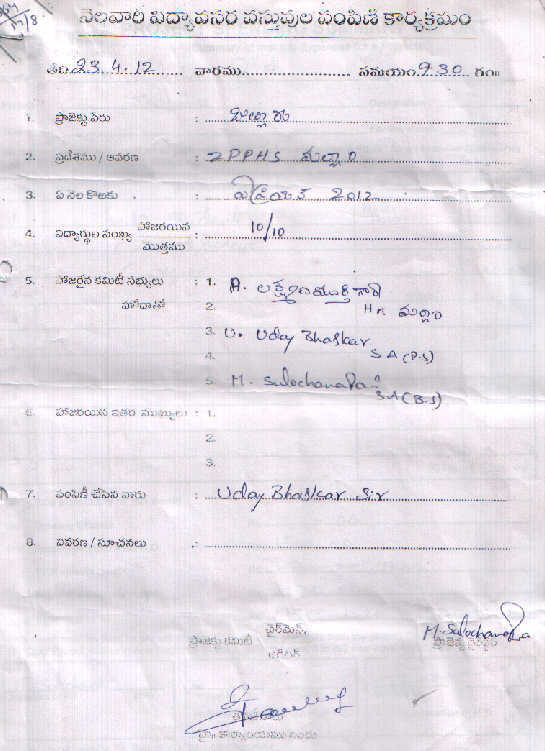 Both schools come under Pithapuram Mandal. Inaugural function of Bighelp project at Jalluru has been conducted in the school premises with following personnel. 10 students have been selected studying between 5th and 9th grades. Smt. M. Sarojini has explained the formation of Bighelp For Education, its aims and present activities of the organization and asked the students to improve their performance. Surpanch has praised the Bighelp for selected their village school and promised to extend their help to the school. Later the books distributed by the dignitaries on the dais to the students. Later the meeting was concluded with vote of thanks by Headmaster. Bighelp received a proposal from Sri. Ch. 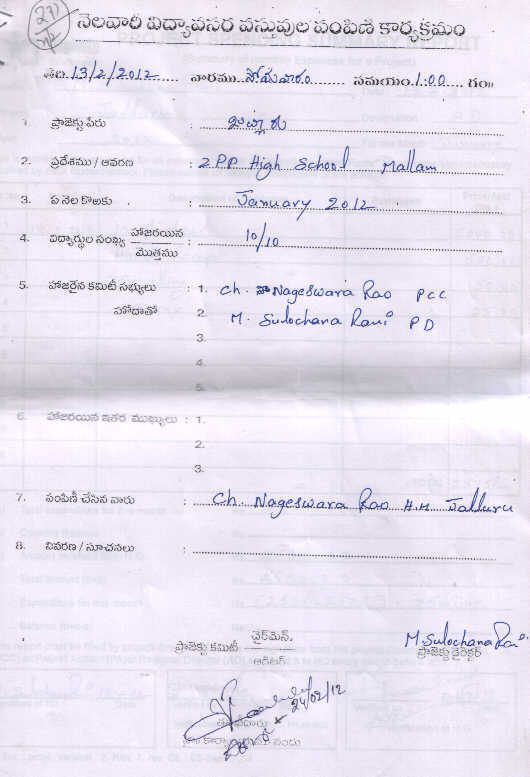 Nageswara Rao (Headmaster of the M.P.P.U.P. 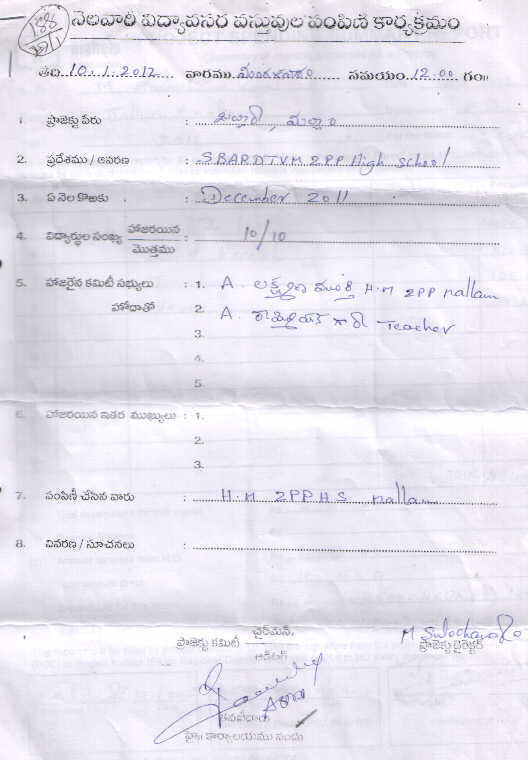 School at Jalluru village) requesting Bighelp to consider their school under Sponsor A Child program. In his letter he informed there are orphan, semi orphan and poor students in the school and also the staff who will work with social service attitude. After receiving the information from Headmaster Administrative office corresponded requesting him to send the list of eligible students to consider his request. Smt. M.Sarojini visited the school during the month of November 2011, talked to the children, parents and school staff to assess the need. The final project proposal and review results have been submitted to executive body. The executive body headed by the Bighelp President Mr. Chand Pasha has reviewed the need for the support and approved the project.